Sailing on a luxury Gullet with a professional crew and great Chef is the perfect combination! 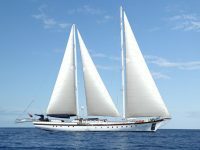 The Gulets we offer for charter have been chosen by us after a visit on board and very high standard of quality. It will be our pleasure to offer you wide range of beautiful Gulets around Turkey and Greece according to your budget.